Capital from overseas Chinese in Southeast Asia has played an important role in the economic and industrial development of Hong Kong with a lot of it coming from Indonesia. 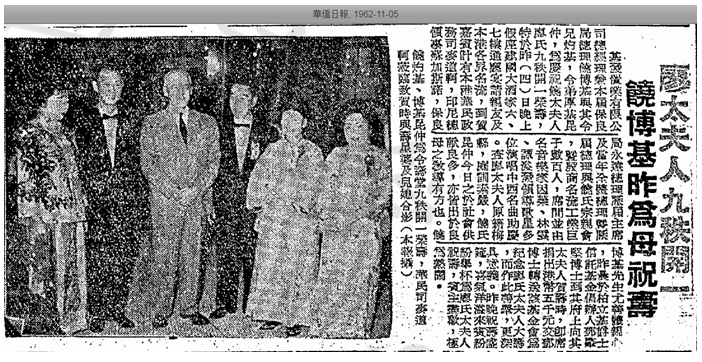 Examples range from the tea and sugar tycoon Kwik Djoen-eng who acquired large plots of land in North Point in the 1920s (see article) to more recent years withthe Salims of First Pacific and the Riadys of Lippo buying their ways into the local financial services and real estate sectors. 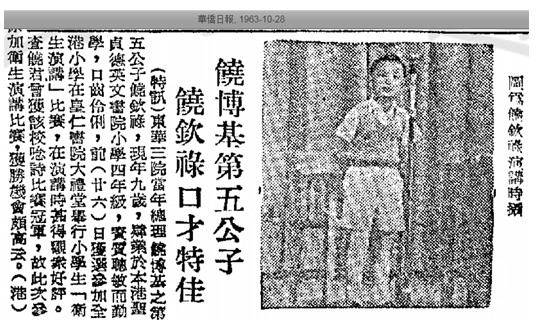 In the 1950s and 1960s, a wave of anti-Chinese discrimination in Indonesia (including riots and legislation limiting trading rights for Chinese) resulted in mass exodus of over 100,000 Indonesian Chinese families from their adopted home of Indonesia back to China and many found their way to Hong Kong. A number of them started Chinese Products department stores in HK–the most famous of which being Yue-Hwa and Chung Kiu. On the industrial front, Tin Ka-ping has been a major force in the plastic industry and philanthropy but another Indonesian Chinese by the name ofDjiauwPok-kie (who adopted the Indonesian name of Djoko Harjono) particularly stood out in the 1960s given his high level political connections in Indonesia. Although largely forgotten today, Djiauw operated a major weaving mill, developed a number of properties (which still stand), made a movie and was a high-profile philanthropist and social activist during his exile in HK from 1958 to 1966. A Hakka native from Mei-hsien in Guangdong province, Djiauw was a totok – an Indonesian Chinese who was born in China.He was involved with the Indonesian military early on and was its highest ranking totok member before independence with the rank of Colonel. He rose to prominence shortly after the end of World War II when he smuggled weapons for the Indonesian nationalistsin their fight against the Dutch colonists during the Indonesian Revolution in 1946 and was later awarded medals for his contribution to the founding of the Indonesian Republic. In the 1950s, he formed Bank Asia-Afrika (亞非銀行), which became one of the leading private commercial banks in Indonesia. Aside from the bank, he was also involved in the leather business (印尼源源皮廠企業) and garment business (印尼龍南織造廠) in Indonesia. Djiauwwas also active in the Chinese community, having led his family association and the construction of the Djauw Family Temple in Jakarta in 1950 and was particularly close to the Kuomintang (KMT) regime in Taipei. In 1957, the Indonesian dictator Sukarno declared martial law and increasingly leaned towards the left. In mid-1958, Djiauw was among a dozen of Indonesian Chinese leaders (which included Bong A-lok of Bank Dirgahaju and HioeNjan-Joeng whose family was active in the HK business scene) who were detained by Sukarno as part of his anti-KMT crackdown. After 8 months of detention, Djiauw was released and immediately headed for HK where he already had business interests such as The Sun Weaving Mill. Although the firm was not incorporated until 1966, Sun Weaving was founded much earlier, likely in the late 1940s. 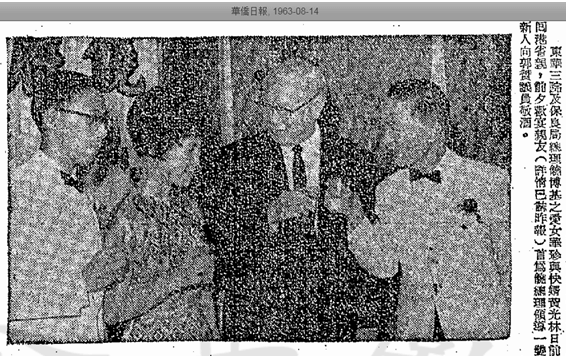 It is unclear if Djiauw was the founder but by 1953 when the firm participated at the HK Products Expo, he was the sole proprietor. At the time, the factory was located at 69 Shantung Street in Mongkok occupying a four-story building (each floor 5000-6000 sqft) with 40 machines and employing 300 workers. The mill had two major products – towels and garments and the towel division had daily production of 3400 pounds while the garment division produced 300 dozens of shirts, jackets and pants under the Himalayas and other brands on a daily basis. The firm’s products were exported to Indonesia, other Southeast Asian countries, the UK and Africa. In 1955, the firm enlisted the law firm of Wilkinson & Grist, private detectives and the police to bust two counterfeit operations which were copying their garment. By 1970, the firm had its main factory was located at 23 Sze Mei Street in San Po Kong with a branch factory at 27-29 Ng Fong Street also in San Po Kong and remains a live company today. The late 1950s and early 1960s were the go-go years in HK real estate with soaring demand from the massive influx of refugees from the mainland. In April 1961, Djiauw incorporated Kie Fat Investment in HK to develop properties with offices located at the 11th floor of the Man Yee Building in Central. 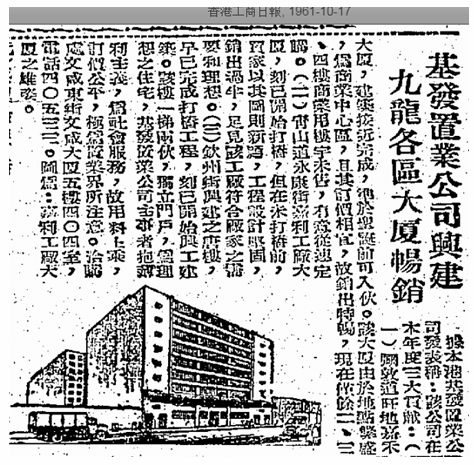 In the 1961 ad below, the firm had 3 developments – the 12 story Cornwall Court (嘉禾大廈) at 687-689 Nathan Road, an industrial building at the intersection of Wing Hong Street and Castle Peak Road in Kowloon (design shown in the picture) and a Chinese style building in Yen Chow Street in Sham Shui Po. 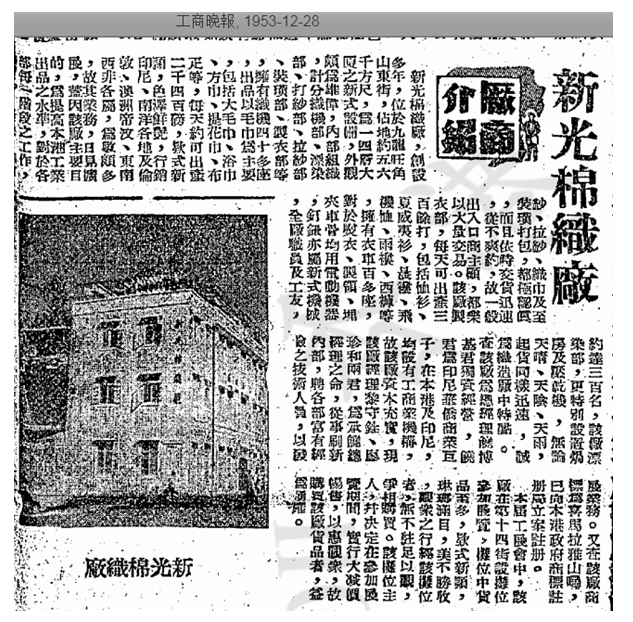 By 1963, another development – the 13 story Gartin Court (嘉田大廈) was being built at 9-11 Ho Man Tin Street. Cornwall Court and Gartin Court still stands today although Kie Fat as a firm dissolved in 2002. Aside from garment and real estate, Djiauw Pok Kie also dabbled in the HK movie industry by forming Djauw’s Films Co (饒氏影業). The firm however only produced one movie in its existence – Money for Marriage (老婆本) in 1964, starring Wu Fung (胡楓), Teresa Ha Ping (夏萍), Tam Lan-hing (譚蘭卿), Leung Sing-bo (梁醒波) and Lee Heung-kam (李香琴). DjiauwPok-kie was married to Lai Chuen-chun (黎全珍) and together they have many sons and daughters. During their stay in HK, they donated generously to many charitable causes including the Boy Scouts. 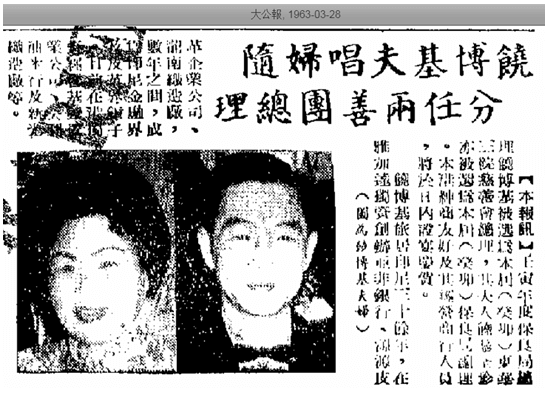 In March 1963, the couple made headlines as both were separately elected to the board of Tung Wah Group of Hospitals and Po Leung Kuk, the two most important Chinese charitable organizations in town. (Djiauw himself was director of Po Leung Kuk the year before) In 1965, Djiauw also became a director of Pok Oi Hospital in Yuen Long. Djiauw stayed in Hong Kong until 1966 when Suharto came to power in Indonesia. He was invited by Sultan HamengkuBuwano IX to return to Indonesia and his confiscated assets were returned. He became active in the banking sector again as the director of Bank Asia Berdjuang in Jakarta. In 1969, Djiauw led the effort in establishing the Chinese school – SPNC Tatung Chung-hsiao Hsueh-hsiao (大同中小學) in Jakarta. He died in Jakarta on January 17, 1973 at the age of 62. This article was first posted on 21st May 2018.